By Matt Jacobs - January 11, 1999 was the day Andy Reid was hired. September 7, 2008 will mark his 10th straight year as coach of the Philadelphia Eagles and the biggest season of his career. That is a feat not many men have accomplished, especially in Philadelphia, where we chew up coaches and spit them out. For 10 years, we've watched Andy turn around this franchise from the laughing stock Rich Kotite and Ray Rhodes left us with. Very few coaches have ever had the kind of success he has. Four straight division championships, along with four straight conference championships, is nothing to brush off. Not to mention he has the third-highest winning percentage of active coaches behind Dungy and our friend in New England. But, when you haven't won a championship in any sport in 25 years or 100 seasons, those numbers just don't mean anything. The Eagles haven't won a championship since 1960! That's 17,363 days for those who are counting. This season is a make or break year for Reid and the front office. The team is finally filled with his personnel moves, and this is officially his team from top to bottom. Brian Dawkins is the only holdover from the defense Ray Rhodes built that carried Reid through his first six or seven years. Now don't get me wrong, I'm not insinuating Rhodes is a better coach than Reid, but that 2000 turnaround happened so fast because of Ray Rhodes' defensive players. Is it coincidence that the team went downhill when most of those players left? If you understand football, you'll know that the defense was responsible for the 2000-2004 team success. And who built that defense? Not Andy! Hugh Douglas, Troy Vincent, Jeremiah Trotter, Ike Reese, and Brian Dawkins would soon be replaced by names such as Mark Simoneau, Darren Howard, Jevon Kearse, Matt McCoy, Barry Gardner, and Levon Kirkland. Still don't know why the team has gone from the class of the NFC to hoping for a playoff berth in '08? Let's look back at the drafts Reid has had. In 1999, he hit a home run with Donovan McNabb. But people forget the Barry Gardner selection in round two, along with the rest of the garbage, none of which is even on the roster. In 2000, Corey Simon was another home run, but Todd Pinkston and Bobby Williams were the next two picks, and not one player from any of the selections is on the roster now. Only one is even still playing in the NFL. In 2001, he found a gem in Derrick Burgess. Know who he bricked on? Freddie Mitchell and Quintin Caver. Only A.J. Feeley and Buckhalter remain from that draft. In 2002, he must have eaten his Lucky Charms because he hit on five out of his eight picks. Lito, Sheldon, B-West, Michael Lewis, and Raheem Brock all were great picks. I have no complaint whatsoever, except they let Brock walk. In 2003, six picks, and only L.J. Smith was successful. The other five (including McDougle, who he traded up to get) will not be on the roster come opening day. 2004 saw another home run in Shawn Andrews. It also saw players like Matt Ware, Trey Darilek, Thomas Tapeh, and Dexter Wynn. Only Andrews and JR Reid remain. This exercise could go on and on (and next year will include the 2005 busts, as they're not officially "busts" yet), but missing that much in the draft takes a 13-3 Super Bowl team and easily turns it into a 8-8 or 6-10 team. Now not everyone hits on their draft picks, and they've probably been around the league average, but let's also not forget who he actually kept on the roster and had the audacity to feed us that they were legitimate starters. Grab your barf bags as I'm about to rattle off the all-turd team: Todd Pinskton, James Thrash, Charles Johnson, Torrance Small, Matt Schoebel, Keith Adams, Mike McMahon, Dhani Jones, Blaine Bishop, Darwin Walker, Greg Lewis, Hank Fraley, Reno Mahe, Nate Wayne, Koy Detmer, N.D. Kalu, Brandon Whiting, Sam Rayburn, Josh Parry, and Dexter Wynn. Feel sick yet? That list of crap makes me have to hurl. The truth is this: Reid's super questionable talent evaluation, inability to make adjustments during a game, and flat out stubbornness that his system trumps talent is the real reason most of us Eagle fans are left scratching our head about 2008. Is this a playoff team, and if so, is it one of the two best in the conference to give us a shot to play for the title? Andy, anything short of an NFC Championship is unacceptable this season. This team consists of all your own players running your beloved system. Don't get it done this year, and this fan base will be calling for your head. A football team raises and falls on the quality and play of the QB and the players that surround him. 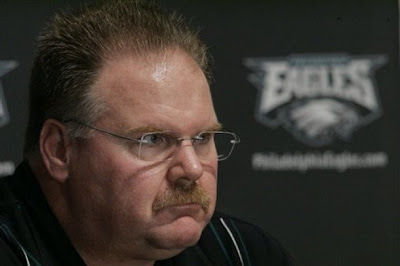 Andy Reid's pick of McNabb was the smartest move he has made to date. Without Mcnabb, we would be seeing the likes of Doug Pederson (you left him off your all turd team. I think he deserves a place on it ) and Mike McMahon. And no playoff berths. I was a kool-aid drinker for a long time but no more. Andy is an example of the Peter principle and his stubborn persona and arrogant approach to the media leaves us fans with a bad taste in our mouth. We have no championships to hold up. He should be going all out to get one. He has not surrounded Donovan with enough quality players and I think we missed our window of opportunity with this team. Buddy Ryan made the same mistake by not getting Randall enough help and what do we have to show for that? Nothing. Reid needs to change himself which won't happen. We will have to wait for Kolb and the next constructed team fro a possible championship. If Mcnabb stays healthy , we can make the playoffs. But does anyone think we can beat the Colts or the Patriots? I don't think so. 10-6, then one and done and see you next yr. I hate having this attitude going into the season.